The Next Mining Boom presents this information for the use of readers in their decision to engage with this product. Please be aware that this is a very high risk product. We stress that this article should only be used as one part of this decision making process. You need to fully inform yourself of all factors and information relating to this product before engaging with it. Graphite, the commodity best known for its use in pencils is now moving exclusively into what looks to be a remarkable future built on modern technology. One company that is keen to participate in graphite’s future is Black Rock Mining (ASX:BKT). 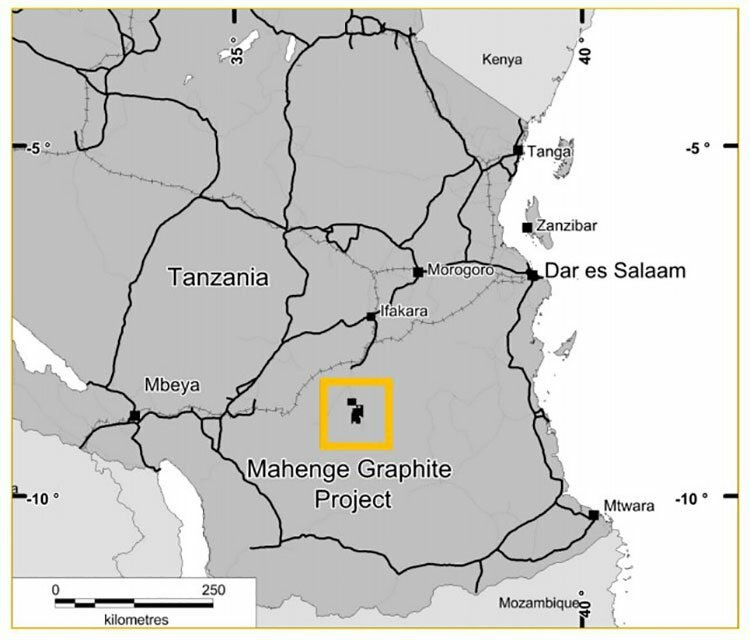 BKT is gradually surfacing to the top of the Tanzanian graphite pool and is ticking off the prerequisite boxes to get its Mahenge Graphite Project into production as soon as feasibly possible. BKT already has some early data in the form of an optimised PFS, but remains a junior ASX-listed explorer worth a paltry A$23 million. As such, BKT could be priced at a bargain at 6.5c per share, with plenty of upside should it be able to prove up its assets. Proof may not be too far away. BKT recently announced it was now the resource tonnage leader in Tanzania. BKT’s Mahenge Project contains 211.9Mt at 7.8% TGC, for 16.6Mt of contained graphite . The higher-grade portion of BKT’s asset includes 37.6Mt at 10.2% TGC or 16.6Mt at 11.1% TGC. In summation, this means that BKT has the best grade-quantity mix of any other graphite explorer anywhere in the world. In fact, the 350km 2 Mahenge Project is the fourth largest (JORC compliant), contained graphite resource in the world and it’s now moving from the PFS to the DFS stage. It should be noted here, however, that BKT remains a speculative stock and investors should seek professional financial advice if considering this stock for their portfolio. Further good news was released this week, confirming the strength of BKT’s resource. The news confirmed not only the high-grade nature of its Mahenge Project, but also, a high recharge rate from the pilot-test material BKT has provided for early battery testing. 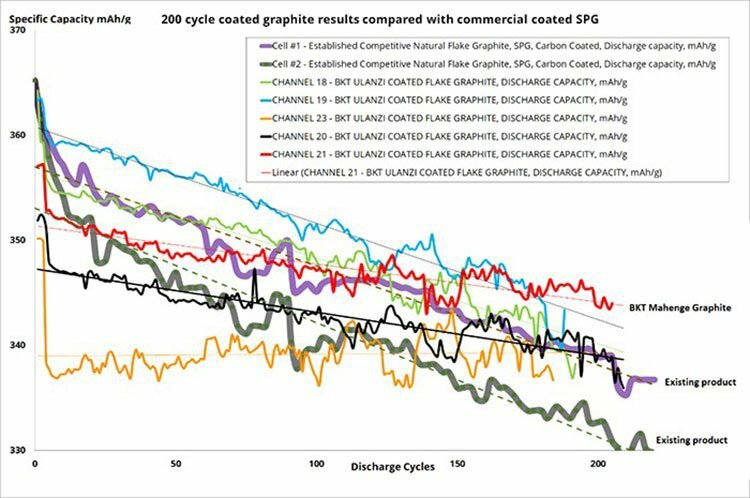 BKT’s Mahenge Graphite Project has strongly outperformed a leading commercial brand in extended 300 cycle charge/discharge tests and its most recent results show a 94% recharge rate (commonly referred to as reversible capacity) over the period, outperforming industry standard products. With close to an additional A$5million raised, BKT is assertively heading towards graphite-sourced revenues, at a time when graphite demand is starting to garner momentum while natural graphite supply continues to struggle. With a successful DFS and associated financing, construction could commence in 2018 with first production in 2019. Graphite demand is growing in light of emerging lithium-ion battery technology while the future potential of graphene continues to impress. Meanwhile, supplies of high-grade large-flake natural graphite remains narrow. Now that Black Rock Mining (ASX:BKT) has opened its account in terms of securing its maiden JORC Resource at Mahenge, the next step has been to finalise its Definitive Feasibility Study (DFS) to further explore what’s buried below Mahenge, and add clarity to how much economic potential Mahenge can really muster. As you can see, BKT has been rather busy over the past six months — working on optimising its underlying ore reserve and project economics. BKT has a rather alluring project on its hands with an estimated NPV of US$905 million (up around 50% from BKT’s original PFS in April 2017) and an IRR of 45.1%. Additionally, BKT is earmarking an operational (opex) cost of US$378 per tonne , thereby delivering an expected operating margin of US$863 per tonne and a subsequent EBITDA of US$220 million (66% margin) per year . Also important, is Mahenge’s nominal size (as Syrah has proved all too well). On this front, BKT wields a Reserve of almost 70Mt at 8% TGC. . Possibly the most surprising feature of BKT’s endowment is its 31-year mine life —a strong estimate for BKT to have under its belt at this embryonic stage of Project development. BKT would be further buoyed by news confirming both the high-grade nature of its Mahenge Project and the high recharge rate from the pilot-test material BKT has provided for early feasibility testing. Results have confirmed the project has strongly outperformed a leading commercial brand in extended 300 cycle charge/discharge tests. These results show a 94% recharge rate (commonly referred to as reversible capacity) over the period, outperforming industry standard products. The 300 cycles test is a benchmark for consumer products, as it represents a two-year product life with an assumed full discharge and recharge cycle every second day. What does this mean for BKT? Well, by successfully negotiating the 300-cycle benchmark, BKT has effectively proved its Tanzanian graphite has sufficient properties to match the current consumer-product standard in lithium-ion batteries. Furthermore, the tests indicate that BKT will be able to deliver a two-year product life for consumer durables, with full discharge and recharge cycles every second day. It should be noted however that BKT is in its early stages of this development and investors should take a cautious approach to any decision made with regard to this stock. BKT is now looking to further enhance its recovery and recharge statistics. Data and methodology developed in the extended battery tests will be used to optimise second generation tests, further enhancing performance and stability. BKT believes the adoption of a long-term LiB battery cycle test program continues to validate its product, and provides a data rich starting point in its strategic objective to establish supply contracts with future customers. Feedback from existing and potential partners has been very positive for the company, and importantly continued product development will remain a core part of its strategy and contributes towards de-risking its path to market. But size does matter to the battery market. Battery manufacturers are loath to switch suppliers when smaller mines finish, so being able to muscle up and supply a couple of gig factories with the same high quality product is a real advantage available only to a few bigger projects. With results putting BKT’s Mahenge project at the top of the graphite pile, let’s take a closer look at the Project itself. BKT has zeroed in on Mahenge with vigour over the past six months, with a hastened news-flow including an optimised PFS and improved project economics. Operating within 150km of Tanzania’s eastern coast, BKT has access to infrastructure links via road, rail and ports to Dar es Salam. These are potentially key factors that could ensure Mahenge’s economic viability and BKT’s future market value. The end goal is to have a 30+ year mining operation underway in Tanzania, able to be mined from multiple zones, at low strip ratios and with future scalability if required. For a company worth around A$20 million at current market prices, BKT could represent an undervalued shot at graphite-market exposure over the next few years. BKT’s recently-evidenced ability to secure further funding, effectively means the Mahenge Project is gradually moving towards full mining capability and becoming a full-service graphite developer in the process. The economics of the Mahenge Project are now becoming ever clearer as BKT formalises its graphite endowment with technical studies. Being fully-funded to complete its DFS at Mahenge helps BKT to de-risk the project and moves the company all the more closer to a construction decision, possibly next year. If and when BKT decides to commence construction of its mining infrastructure over the coming 1-2 years, it will be in a great position to take pole position amongst other ASX-listed peers in Tanzania. As we’ve said, BKT has the largest JORC Resource in comparison to any other local peer and has the 4 th largest JORC Resource globally. Which brings us to possible BKT’s most important ace card: its graphite flake size and quality. 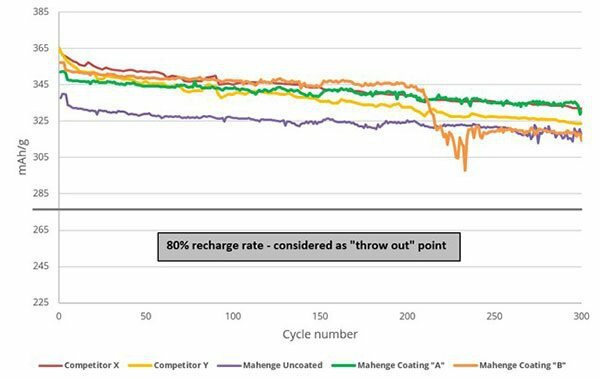 As you can see, testing shows that up to 209 charge and discharge cycles can be readily achieved and indicates Mahenge test cells are demonstrating both flatter charge/discharge curves and a higher storage capacity, compared to other commercial comparison samples. This could prove very significant for BKT’s commercial chances (and end-users) as the Mahenge Project develops the scope to deliver consistent quality graphite concentrates for decades. If BKT is able to produce high-quality SPG (spherical graphite), it will likely mean a steady supply-line to the growing brood of battery manufacturers globally. One very neat application of graphite, likely to become the norm over the coming years is fire-proof cladding. London’s Grenfell Tower tragedy has served as the alarm clock for many town planners around the globe to wake up to the problem of insufficient insulation and/or fireproofing. In China, an entirely Government-led initiative has been launched to ensure all future buildings are erected with sophisticated fireproof cladding — and graphite just happens to be the perfect building block for such an enterprise. Graphite’s physical properties make it highly fire resistant, drastically more cost-effective and completely non-toxic. 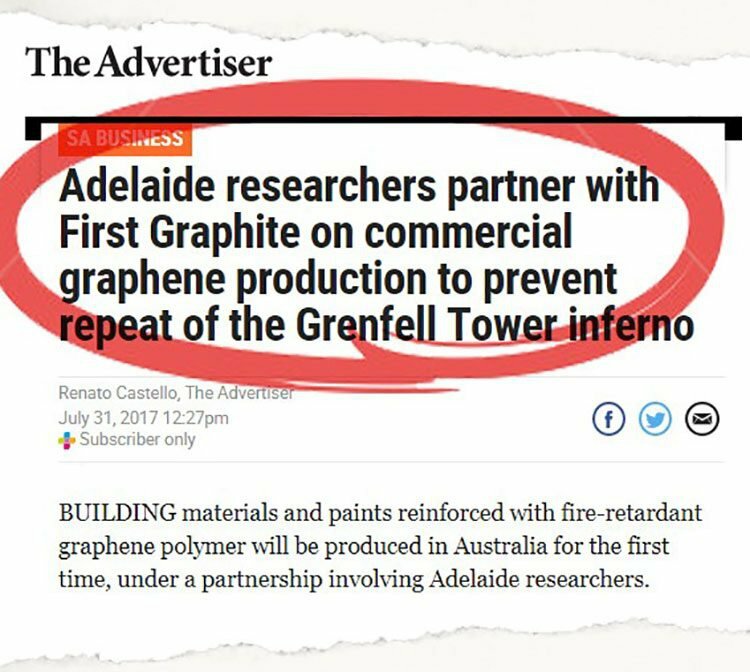 If graphite is appropriately processed, its derivative Graphene has even more sci-fi properties that can be aptly commercialised. Graphene is the world’s strongest known material and can withstand temperatures of up to 700C. If successfully developed, graphite/graphene open the door for fire-resistant wood engineered with the help of graphite. BKT has multiple options here i.e. offload all of its excavated ore (at a low grade), or process its graphite ore independently, thereby raising the product grade alongside the sale price. Synthetic and natural graphite have huge differences — including varying composition, differing qualities and vastly different sale prices. Synthetic graphite is a material made from petroleum. It is derived from high temperature processes that require a lot of wasted energy and safety protocols. Until recently, it has been used for specialty applications because of its superior consistency and purity (>99% TGC) than natural graphite. Manufacturers have therefore preferred it because it offers higher reliability and performance, even if its price commands a supreme 200% premium compared to natural graphite. Meanwhile, in the other corner is natural graphite. Natural graphite is also the basis of graphene. Whereas synthetic graphite is very limited when it comes to graphene, natural graphite is slowly-but-surely becoming the preferred variant. Indeed, graphene’s potential has been so resounding, that the EU chose to contribute €1 billion to private and public entities to fund graphene research. The entirety of its focus is natural graphite, rather than synthetic. Despite the current difficulties of bringing graphite production up to the required technical levels (on an industrial scale); the future of graphite commercialisation is likely to be dominated by natural graphite given the overwhelming preferences of end-users and battery manufacturers. All in all, natural graphite is much cheaper and better environmentally-suited than synthetic. Synthetic graphite will continue to dominate for the next few years in current applications requiring high purity, while available natural graphite production will be preferred for the manufacturing of refractories and other applications in the steel industry. So, let’s take a look at how the graphite macroeconomic background is looking in contrast to BKT’s market-stomping motives. To take advantage of the region’s graphite abundance, BKT is developing a world class graphite deposit in Tanzania. The Mahenge Project is small enough to chew and large enough to swallow. In other words, it is manageable and fairly de-risked from a technical perspective, but by the same token, is large enough to supply several decades of consistently high-grade jumbo-flake graphite. Very importantly, BKT has avoided the same mistake made by Syrah Resources (ASX:SYR) a few years back, by swinging for the fences and targeting a multibillion-tonne Resource, costing hundreds of millions to bring online. BKT’s tenements contain high grade, jumbo flake graphite that is likely to command premium prices when ready for sale given its versatility and purity. Meanwhile, in very close proximity to BKT is an ASX powerhouse in the form of MNS and other ASX-listed hopefuls. MNS is further advanced in its project development, and effectively almost in production. MNS is also further advanced in its exploration compared to BKT by around 1-2 years, but is currently worth A$260 million by market capitalisation – that’s more than x10 BKT’s current value. BKT has a chance to emulate this path, subject to its project development progressing on schedule. Also in the running to rule the graphite roost in East Africa is BKT’s direct tenement neighbour, Kibaran Resources (ASX:KNL). KNL’s asset has over 2Mt of contained graphite and has already sealed a 10-year offtake agreement with German ThyssenKrupp for a minimum sale of 20,000 tonnes per annum of refractory grade natural graphite. Going from junior explorer in the early stages of development — to now having the world’s fourth largest JORC Resource — is an excellent achievement for BKT. With a maiden JORC Resource in the bag (and with expansion-potential peaking), BKT has quickly moved on to targeting the completion of its DFS. BKT is also well funded with iron-clad management support and has significant news flow set to unravel in the coming weeks and months. So far, BKT has taken the right steps on its path to claiming Tanzania’s biggest graphite Resource and the world’s 4 th largest. Bear in mind that BKT has claimed over 2,600 sq. km. of highly valued real-estate, in a region where there’s more graphite than the rest of the world combined. The next steps are to pursue diligent exploration to complete its long-awaited DFS and begin supplying its product as part of pilot tests in preparation for a formal decision to mine the Mahenge Project. Capped at just A$26 million, BKT’s valuation has a lot of catching up to do, and signs are it has all the project caveats taken care of, to become one of the region’s most dominant graphite producers, rivalling Syrah, Magnis Resources and Kibaran. It has a long way to go to achieve this, however, and investors should seek professional financial advice if considering this stock for their portfolio. BKT could be a good stock to leverage the impending graphite/graphene revolution that’s already seen several explorers reach multi-hundred million-dollar valuations without a single gram of production. Could this happen to BKT? BKT is transitioning from an explorative junior to a productive graphite processor right before our very eyes. 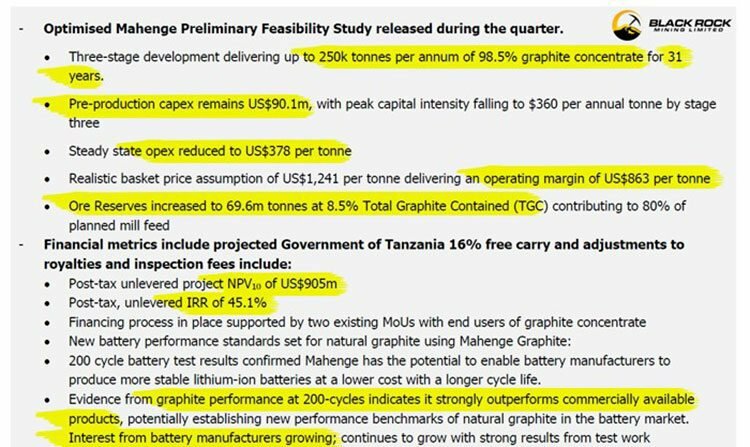 The strong position BKT now finds itself in validates its original graphite-focused strategy set in motion in 2015/16 — aiming to secure ultra-low capital costs, high margins and flexible scalability in Tanzania. With explorational progress on track, and a goldilocks project in its sights, BKT now has several avenues through which it can see its share price revalued in the short-medium term.